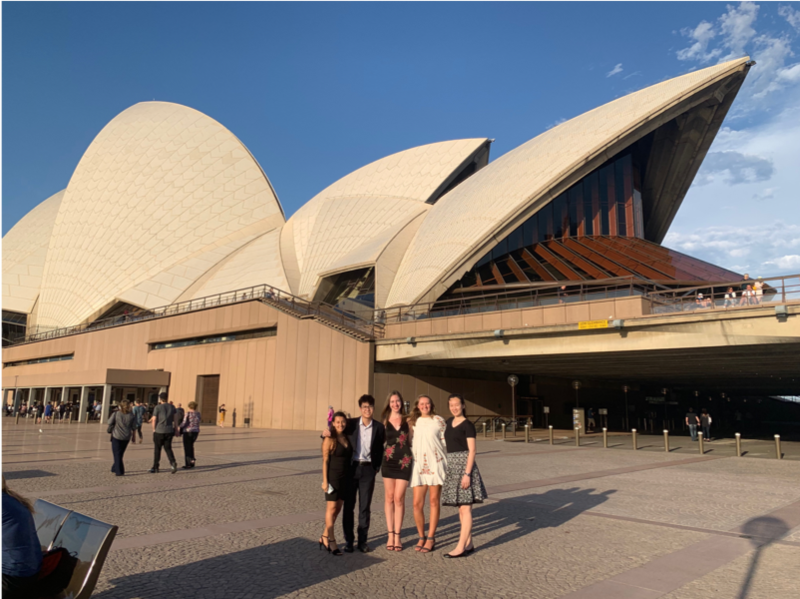 ‘Down Under’ the Australian Sun Claire Mackin '20 shares her experiences in Sydney as part of the Sydney Internship and Study Abroad Program. We have been living in Sydney for two and a half months now, and wow, that feels crazy to say! Somedays, it feels like I am living in just another large U.S. city, while other days truly remind me I am on the other side of the world from home. No matter the day, however, all are great living “Down Under” the Australian sun. We came to Sydney in the midst of summer. Because of this, we had an interesting and somewhat unconventional first two months in the city. For the first two weeks I had – gasp! – no obligations. 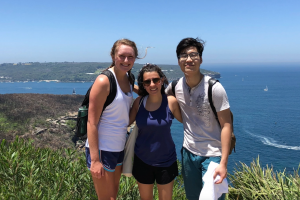 While my friends back home were beginning their winter semesters, I spent the first two weeks exploring Sydney, going to the beach and really getting my bearings. The next two weeks I focused on my internship. While here in Sydney I am interning at Mintel, a global market intelligence firm that provides valuable information to its clients about consumers and market trends. The following two weeks I spent every day in class attending my marketing course. Next, I went to New Zealand for a week. It was an incredible experience spent with breathtaking views and some great W&L friends (Beau M. ’20 and Evan K. ’20). Then it was back to my internship for a week. This was all before the “real” semester even started at the end of February. If it sounds somewhat chaotic, it was! It was challenging at first to not have a strict and uniform schedule that I am used to back home. Looking back, however, it really gave me the chance to better understand what I wanted out of my study abroad experience. It was also the first time, maybe ever, that I had so much free time and independence. I spent the time learning to cook, focusing on myself and exploring the city. While I did not realize it at first, these relaxing first few weeks have allowed me to jump fully into the new semester. Claire Mackin ’20 in the commentator’s box at the Sydney FC soccer game. The official semester at USyd began at the end of February. I am taking European Economies, Cross-Cultural Management, and the ever-so-popular, Sport and Learning in Australian Culture. Admittedly, it is hard not to single out the sports class as my favorite. In the first three weeks, we have already been to a soccer game (I had the privilege to go inside the commentator’s box), a rugby union game, and a rugby league game, and there are still so many events to come. All of the classes, however, have been great. It has taken time to get used to the large lectures, but all three classes have nicely complemented my studies at W&L. It has been really interesting to observe the different culture at USyd compared to at W&L. At USyd, many of the students are only on campus two days a week and the other days they are working at jobs or completing internships. Many also travel over an hour to get to school, whereas the walk from third-year to the CGL has often been deemed too far of a hike by me and my friends! Studying at USyd has been a nice change of pace and it has been quite fun to take classes I would never have had the opportunity to at W&L. Once a week I also continue to intern at Mintel. Already, I presented to the team 30 new and innovative products that I then turned into a presentation that Mintel has passed on to its clients. I have also helped gather information and research about a variety of topics about the current market environment for clients. Furthermore, just a week ago, Mintel hosted its biggest event of the year, The Big Conversation. I was given tasks to help prepare for the event by finding people to invite, sending out invites to them, gathering materials for the event and more. I was then able to attend the event at Sydney’s Museum of Contemporary Art and mingle with some of Mintel’s clients. It was so nice to see the hard work of the company be highlighted at such a great event. Living in Sydney has been amazing! Reminiscing about the first two months has been a great chance to realize how much I have learned and grown in such a short time. Even more than that, it is crazy to believe that Sydneysiders here have already declared summer to be over (what happened to all year summer!?) and that we are already half-way through our time here. There is still so much to see and do—an amazing trip to Cairns and the Great Barrier Reef is on the horizon—and I want to be sure we do all we can!